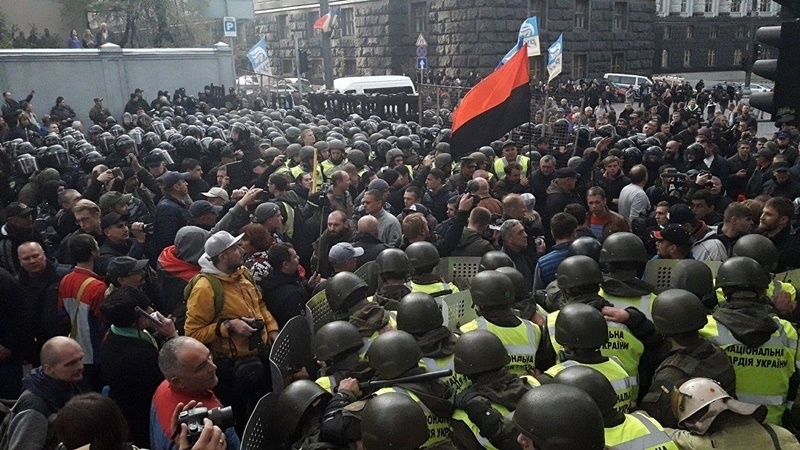 On October 22, near the building of the Verkhovna Rada of Ukraine not far from the tent camp a conflict occurred between the police and the protesters. A man intended to bring another tent to the tent camp, as a result of which a scuffle took place, in which the law enforcement officer was injured. “Today at about 6:30 p.m. from the side of the Shelkovichnaya Street, an unknown person tried to carry a tent to the territory of the protesters' camp and provoked a conflict with law enforcers. A scuffle occurred, as a result of which a member of the Podolsk police department received a head injury. According to preliminary information, a man hit a policeman on the head, the officer lost consciousness and fell on the ground. The injured was assisted by ambulance doctors, and the offender was detained in order to establish all the circumstances of the incident,” the Department of Communication of the National Police reported. Later, near the tent camp, the People's Deputy of Ukraine from the faction "Samopomich" Egor Sobolev hit a man calling him a provocateur for trying to bring a tent to the tent city and set it up. The man said that he did not understand why he was beaten, but refused to give evidence to the police. The ex-head of the Odesa regional state administration Mikheil Saakashvili said that the rally outside the Verkhovna Rada, which began on October 17, will continue "at least until the next plenary week", that is till November 7. “In the next weeks before the session [of the parliament] we have ... to rebuild this site into a very calm, powerful, safe place," he stated. Earlier, the police spokesperson Oksana Blishchik reported on her Facebook page that law enforcement officers detained a man who was going to a rally to the building of the Verkhovna Rada of Ukraine with weapons. The Interior Ministry said that the order at the rally in the center of Kiev is guarded by 3,500 representatives of security forces.